In our time and age, aircraft like McDonnell Douglas 80 (MD-80), a.k.a. 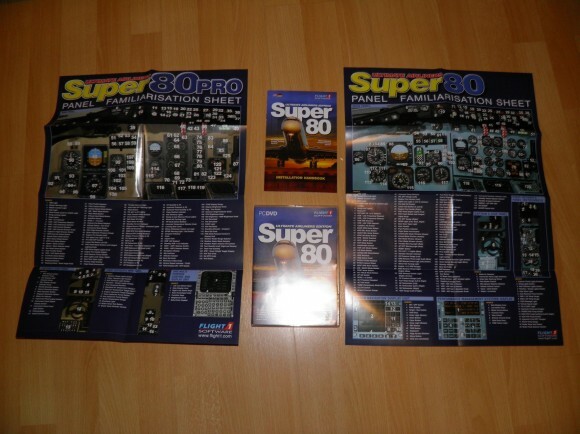 Super80, Maddog or DC-9-80 series, are slowly disappearing. Newer, more fuel-efficient and more automated aircraft are coming onto the market. The older aircraft gain age and go out of production, which is basically the story of the Super 80. Still, lots of airlines still use them. American Airlines and Delta in America for example, and SAS and Spanair in Europe, just to name two. Thus these planes are no strangers to our airports, no matter where you are in the world and lots of them remain active to this day. 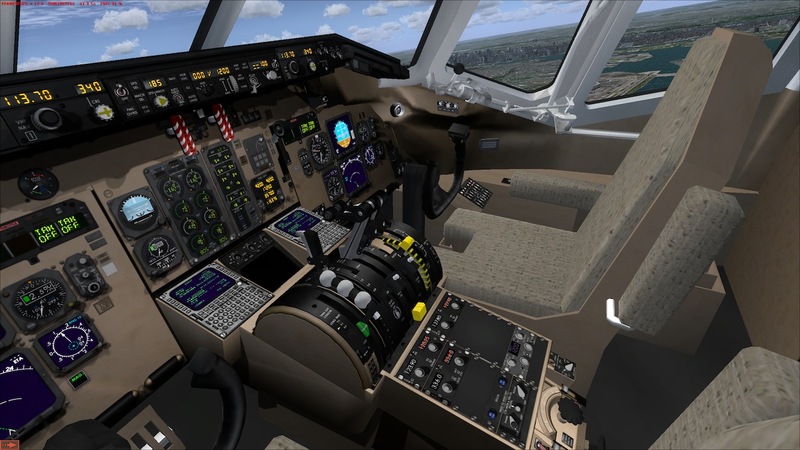 It is therefor not strange to see not one, but two MD-80 products for flight simulator. One is the Leonardo Maddog by Leonardo LSH, the other is the Super 80 by Coolsky/Flight1. In this review, I will look at a new iteration of the Super 80 product: a Super 80/Super 80 Pro combined package dubbed “Super 80 Ultimate Airliner Edition”. The pros are simple: you get more for less. For the rest, the two products are identical to their standalone counterparts. Note that this product is a Boxed only product! – Installation and general instructions booklet. 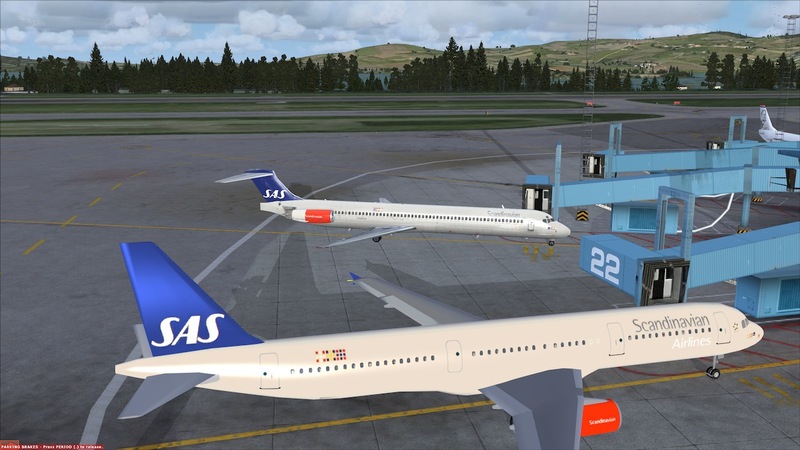 – Full FSX models, with FSX-only features. As a result, the product is not FS2004 compatible. 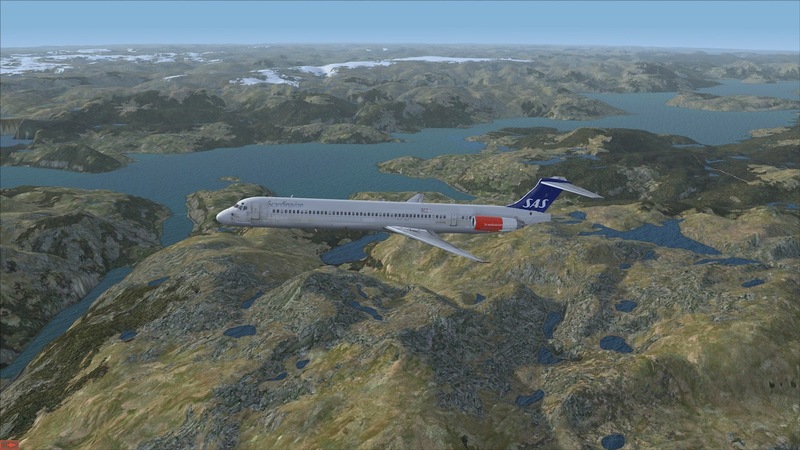 As you can see, you get the full range of MD-80 systems, which enable you to simulate a wide range of flights and operations. 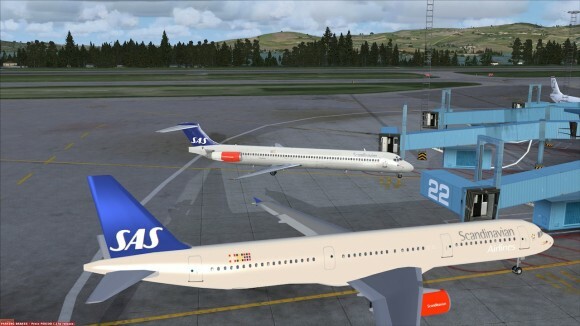 Another plus of this package, is its wide acceptance and use, resulting in four McPhat livery packages and lots of free liveries at library websites such as Avsim and Flightsim.com. 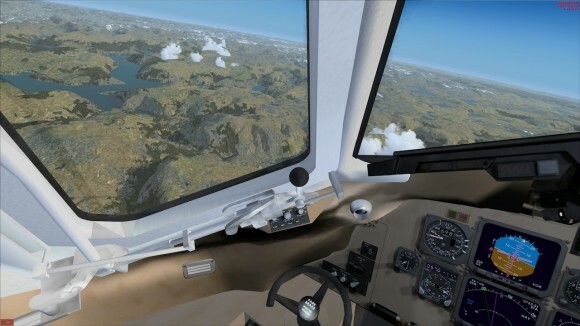 An interesting feature of the package is the integrated cockpit training system (ICTS). This system will be looked at more thoroughly later on, but suffice to say now is that I see it as a great aid for those new to the type. 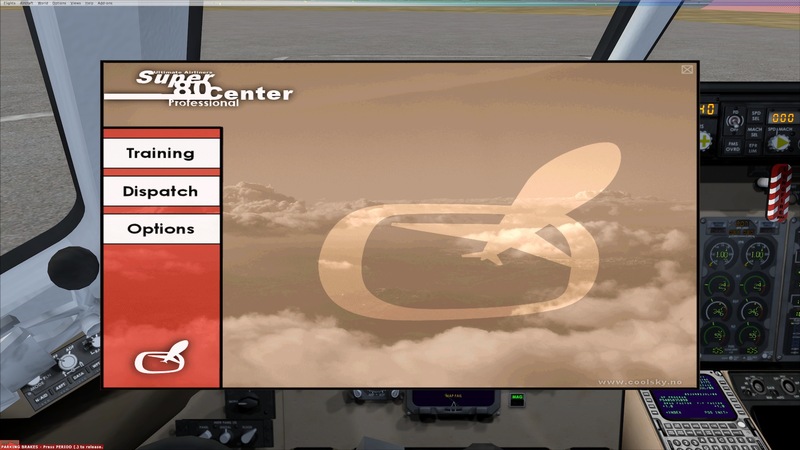 The same program that contains the ICTS also contains setup and load out windows, compiling all you need to setup your flight in one neatly organized window. This, in my mind, is how it should be! The upper photograph shows the box only. The lower photograph shows the two posters on each side, and in the middle the booklet and the box (sorry for the flash, but the box can be seen on the upper photograph). Note that the back of the posters is also printed on! Note that in this reviews, I spend my time looking at the Super 80 pro. The Super 80 with the analog panel is, in essence, a separate product bundled with the pro edition for the UAE. Since the pro edition, from what I understand, is newer than the classic edition, I opted to look at the pro edition since, logically, it would be more advanced and a better representation of Coolsky’s current skill set and technological capabilities. The very first thing you see is actually a huge splash screen. If you don’t see this, chances are that serial validation had gone awry and it’s the root of some problems you might encounter. However, assuming you have seen that splash screen and clicked it away, you get to the very first view of the Super 80 Center, shown above: a simply welcome text, but the arrows in the lower right corner hint that there is more to it. 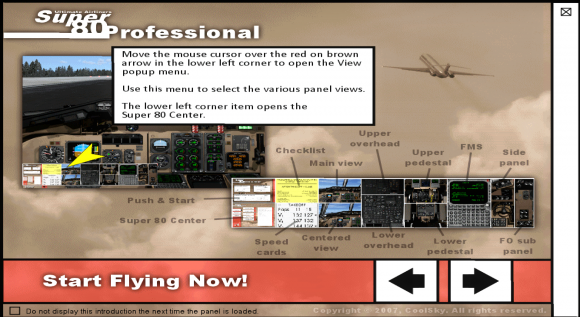 The second screen gives a short explanation of how to use the View pop-up menu, which is a sort of panel navigator. The panel navigator is a strip in the lower left corner of the screen that gives quick access to all the planes pop-up (2D) panels. 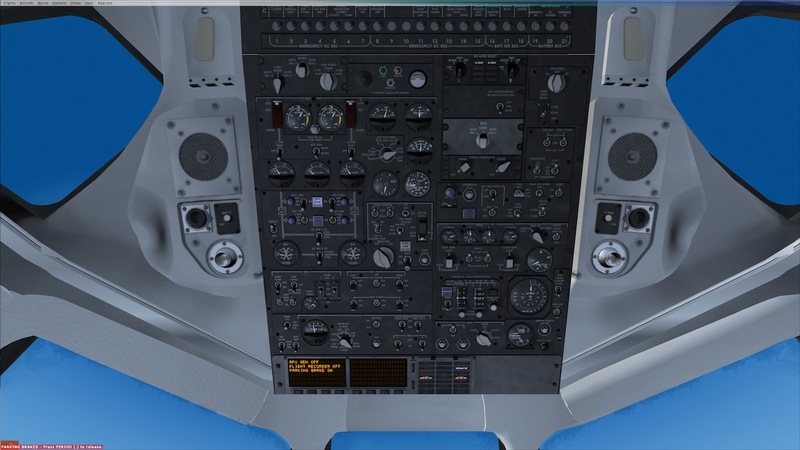 As such, you’ll never have to guess what key combination is what panel, and you don’t have to get into the main instrument panel 2D panel to access the other 2D panels like with so many addons. The panel navigator is a very user-friendly, easy and innovative way to quickly give access to all panels. The third intro screen introduces the Super 80 Center proper. It shows the three available tabs. 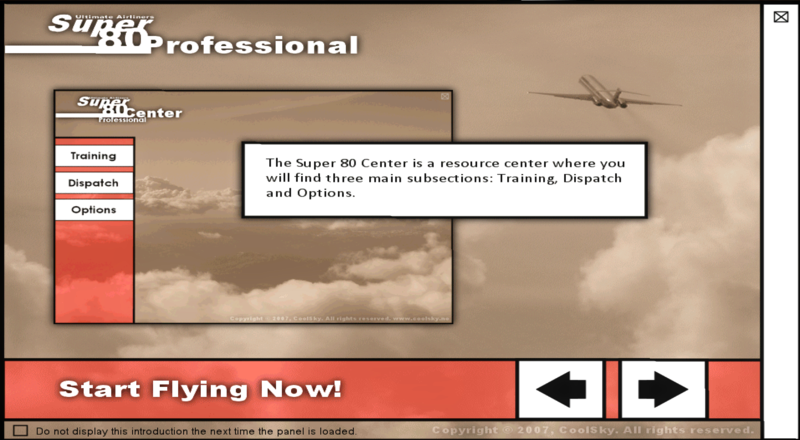 The fourth intro screen introduces the training subsection of the Super 80 center and gives a quick overview of what it does. I’ll soon go into more detail about this. The final intro screen introduces the automatic aircraft configuration utility. Many addons actually have this sort of thing, but it’s usually a bit cumbersome. I’ve rarely seen it done so well and so intuitively as in the Super 80. I congratulate Coolsky with this innovative way of thinking! The five intro screens show pretty much where everything is located and how to operate it. From this point on, nothing is stopping you from learning to fly the plane, which is a great thing. It is because of these sort of features that the Super 80 UAE is very good for beginners in the commercial jetliner world. Everything is so clear and intuitive that you’d hardly have any problem getting started. Now let’s dive into the Super 80 Center’s functions. The Super 80 Center is your core utility to learn how to fly the plane and configure it according to your needs. You can easily open the Center by going to the View pop-up menu and selecting the Center from there. You will then see three tabs, labeled Training, Dispatch and Options. The Super 80 center’s main screen. The Super 80 Center’s training tab opened. When you click the Training tab, a black arrow appears behind it, making it always clear in what tab you actually are. It’s a small thing to add, but it’s so useful and makes things so clear, that not having it would be a world of difference. Little things like these, that can clarify UI operation are often ignored, and not for good reason! We furthermore see a list of all kinds of options we can click on. Most of these are guides. 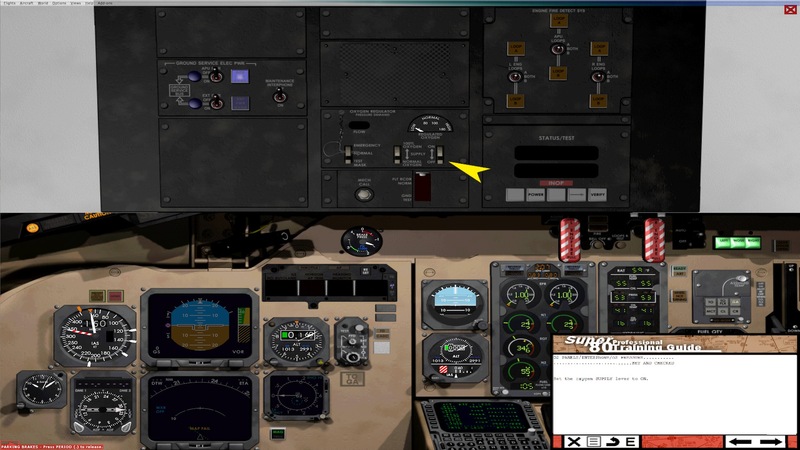 Opened in the above shot you see the Automatic Aircraft Configuration, which is a simple panel load utility that automatically sets your plane up according to the state ou have selected. I have always used the cold and dark setting. The Checklist Guides tab opened. The yellow pointer denotes what has to be set. The next checklist item is for a new switch to be set. 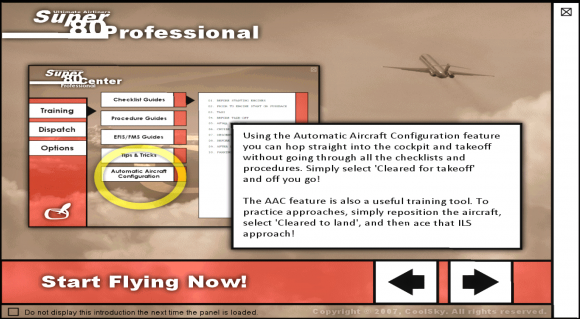 The training module automatically opens the correct 2D panel and points to the relevant switch. All of the training modules are the same, in this respect. All are very simple to follow, and it’s always clear what to do. If there is no yellow pointer, then it’s clear that there’s nothing to press. Simply read the text and you’re good to go to the next item. If something is not simulated, then that’s said also, so that you don’t endlessly click the switch hoping that eventually you’ll be able to set it correctly. 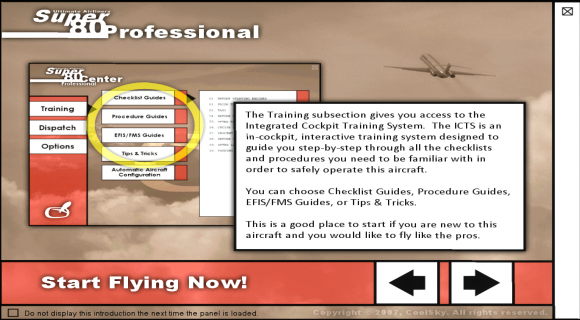 Do note that even with these training modules, it is beneficial to read the accompanying module and do some actual flights. 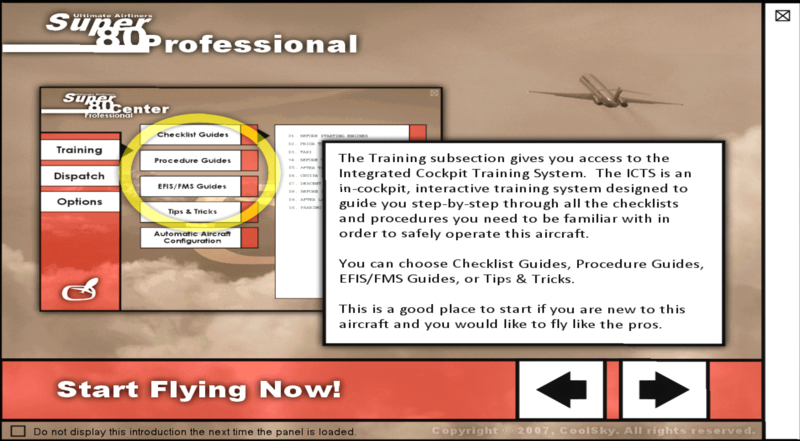 While the training module is very handy, it does not fully replace good old-fashioned reading. The second tab in the Center is the dispatch tab. 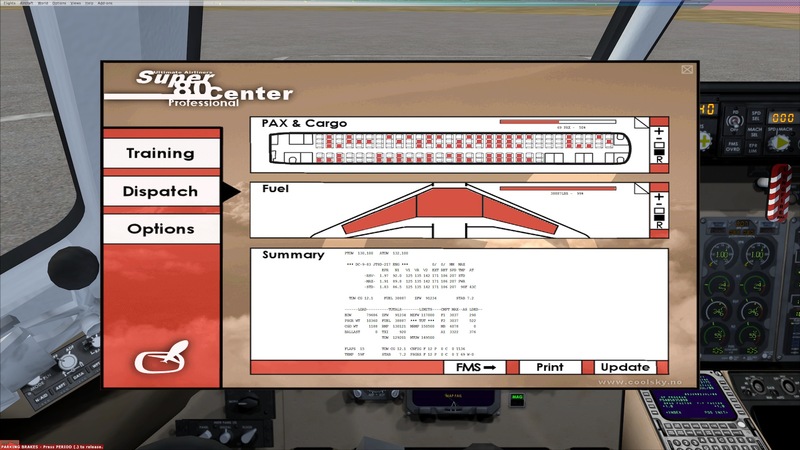 This tab allows you to set passengers, cargo and fuel. 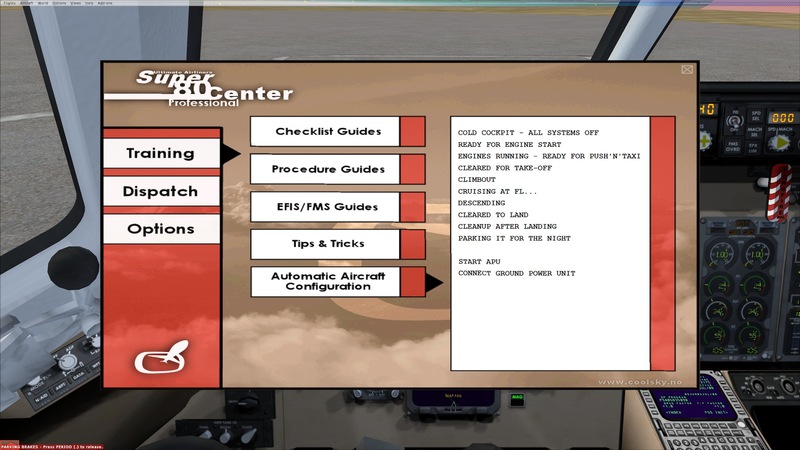 This is a utility that many high fidelity addon planes have (otherwise you simply use the default FSX one), but what not all of these addons have, are options to print it all out and automatically input the data into the FMS. Sometimes it happens that you don’t have the patience to start inputting all the data into the FMS yourself. Just clicking the FMS button will save you some time you might want to spend flying instead. Again, this is one of those little things that greatly enhance the plane’s user friendliness. The final tab is the options tab. This tab simply allows you turn options on or off, such as F/O callouts, or adjust sound volumes. 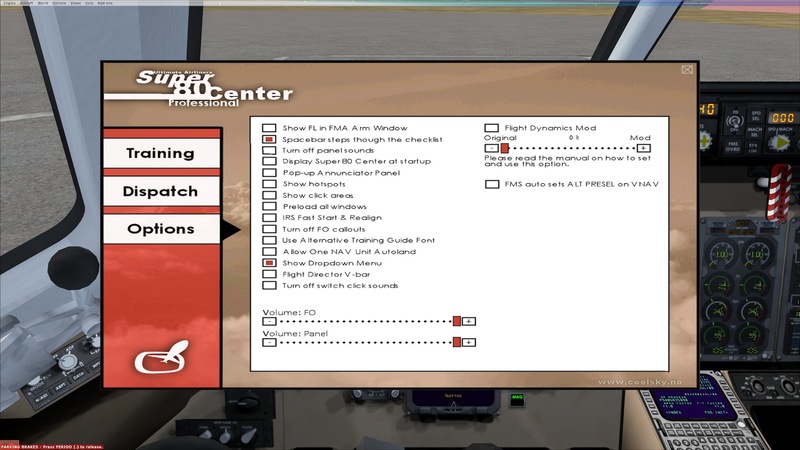 It’s pretty straight forward, but I like how it has been integrated into the Super 80 Center, many addons have separate screens using the addons menu of FSX, but I like this way of going about it less because they are not “seamless”. The Super 80 Center never takes you really out of the simulation. So not only is it more intuitive and user friendly, it also doesn’t break the realism of flight in quite the way other addons sometimes do. By all means, the Super 80 Center is a great innovation and I hope to see it in all of the Coolsky products, and maybe other addon developers can learn from it too. Here’s what I like: Espen makes an addon with features that he himself would really like to see, and he doesn’t let things get in the way of that, thereby making something that’s truly “his”. This personal approach is a great one, moreover when it ends up with features that are so useful and well thought-out as the ICTS. Although I tend to say that I’m not affected much by external visuals, in reality that’s a blatant lie. As soon as I discover faults in an airplane model’s exterior, I like the plane less than I liked it before. This is not as dramatic as it sounds, and I’m pretty forgiving if the faults aren’t too big. This forgiveness deteriorates with higher pricing or higher amounts of faults. The fact that I start talking about faults and the way I go by them probably sounds like I hate the exterior model of this plane. That’s far from true, actually. 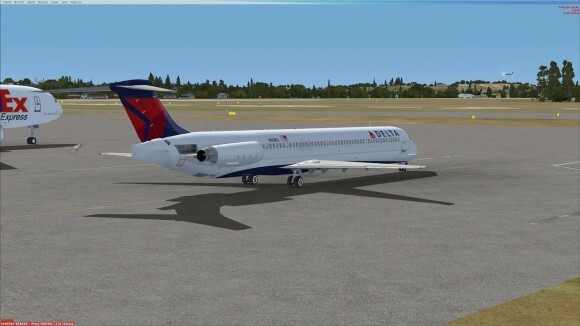 I think it’s probably one of the best MD-80 exterior models we have. It certainly seems very accurate. What’s also nice is that you can look through the windows and see the cabin. Unfortunately the cabin is completely empty, but it looks nice nonetheless. The package comes with lots of repaints. Amongst these we find McPhat repaints. Generally, these repaints are beautiful. They are extremely detailed and thanks to their good use of the specular and bump maps, an aircraft’s exterior can truly come to life. For as far as I have seen the repaints are also accurate, which is something that isn’t always the case with McPhat repaints, sadly. However, it is very nice that these repaints come bundled with the package, and I myself tend to fly the McPhat repaints and not the standard ones that anyway were part of the Super 80 product. 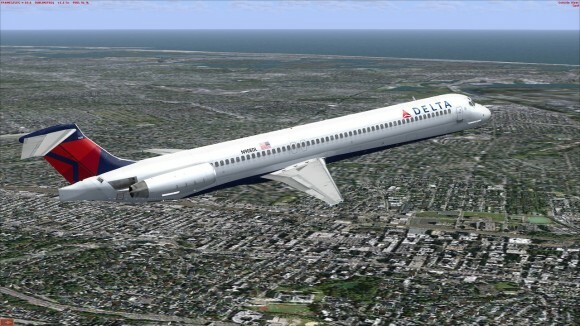 A realworld Delta Airlines MD-80, parked at JFK. Photograph made by myself. 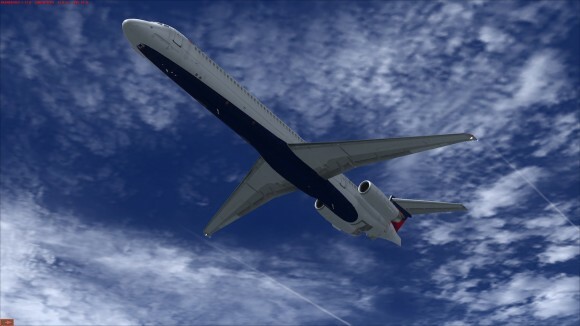 Above you see a real-world MD-80. I acknowledge that its not the best angle to view the plane at, but it’s sufficient. You can check the Super 80’s model against this real-world plane, and I will do the same in this chapter’s final paragraph. Pose resembling the real world photograph. 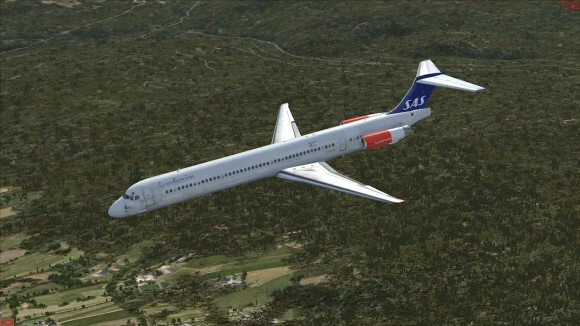 The above shot is an attempt to mimic the photographs of the real MD-80. As you can see it already seems to be a very close match, except for some small things that really are not the fault of the model. The tail is different, for example, but that’s because of a different configuration of the airplane, not because the model is wrong. The Super 80 flying: left side. Let’s look at some screenshots. Above you see the left side of the plane. Note that this is a McPhat repaint. Some things that catch my eye immediately are the transparent windows about which I already talked previously. Also the good texturing stands out. But what’s also really nice is the overall accuracy of the model. 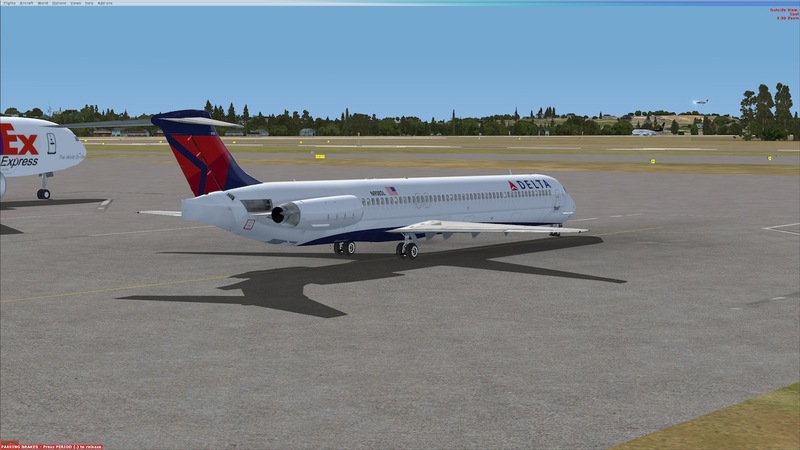 It’s a very nice plane, the MD-80, and it’s great to see it so well reproduced in this addon. The MD-80 always has this characteristic winglet-style thingies at the nose of which I have no idea what the correct term should be. You can see them mounted under the cockpit windows, in line with the plane’s nose cone. Also look at the nice details on the belly of the plane, and the overall good texturing thanks to the McPhat repaint that did a very nice job on this Delta Airlines repaint. We can now admire the Super 80’s belly with more ease. There sure is lots of textured detail, but we can also seem some pretty nice modeling, both on the belly and under the wings. Also notice the intricate modeling of the landing lights positioned on the wingtips. Finally, the engine’s modeling pleases me to say the least. They look very nice, very accurate. Now it’s time to look at the plane’s upper side. Overall the plane looks great. The modeling seems very precise. Also here there are some nice details to point out. For example, the windows wipers are nicely modeled, and a whole array of sensors and antennas can be seen along the fuselage and wings. Finally, the texturing is very nice, also on this side of the plane. Overall, I really like this model. The model itself is accurate and contains lots of nice details. The McPhat textures are a great bonus too. In summary, I think the Super 80 model resembles the real-world photograph at the beginning of this chapter very well. From the tiny details of the sensors to the gross modeling of the fuselage, everything that needs to be there seems to be present and is topped off by McPhat’s quality texturing. In this department, the Super 80 resembles the plane very well. Now how about the cockpit? I love the concept of the virtual cockpit. 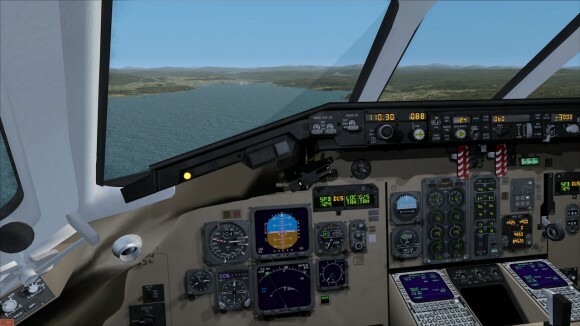 I think it’s the best way to fly an aircraft, and I spend most of my time in the VC of an aircraft. Not all aircraft make this possible, however. For example, the huge, knob-filled overhead of a Boeing 747 is very hard to operate from the comfort of your seat, in my opinion. I tend to call up the 2D panel for these instances, but I never use the 2D cockpit to fly my aircraft if not absolutely necessary. It is because of this that I would like to see detailed VCs in my aircraft. For me, the Super 80 definitely lacks in this category. Why? Because everything is completely flat. It is clear the developers tried to enable some sense of 3D by the way some knobs were drawn onto the panels, but in reality, if you move your head just a bit, you immediately feel cheated. Although the VC is entirely flat, you can see that care was taken to diminish the impact of that fact: the texturing is very good. I can’t say I’m a fan of it, however. It is good in the sense that it is very detailed and hardly blurry in most areas. What I don’t like about it, is that it comes across very digital, as opposed to photoreal. This is a personal thing, of course. Some people prefer the digitalized look, but I like a more photoreal look. In the end, I’m not that pleased with the VC. The good texturing is no replacement for pure 3D modeling to me and in the current FS times, I find it even a bit cumbersome not to have 3D cockpits. I can’t be bothered too much if some parts are not 3D, but in the Super 80 it’s extreme. Basically, everything is flat except the throttle quadrant. If ever it is decided that a remake is done, or some kind of update, I seriously wish the VC would be updated so as to bring it up to today’s standards. With that come some functions that certainly are very user friendly, but diminish the feel of realism even more. For example, nav radios 1 and 2 are not simultaneously visible. You click a button under the radio to flick it from nav radio 1 to nav radio 2. While this is user friendly in the sense that you don’t have to “lean over” to the F/O’s panel to look at nav radio 2, it is of course utterly unrealistic from a simulation point of view. As it stands, I therefor think that this VC doesn’t really help the simulation aspect of the addon, although I do value its user friendliness. Still, I’d rather have more realism. And now for some screenshots. First you’ll see some screenshots of the Super 80 Pro, featuring the EFIS panels, and after that of the Super 80, featuring the analog panels. The view from the captain’s seat. Looking over to the F/O’s seat. A view of the entire main instrument panel. This shows the panel selector. Something very important in addon planes are the sounds. Not just engine sounds, but also button clicks, flap sounds, gear extension and retraction sounds, you name it. It is also no coincidence that the better a soundset is, the more enjoyable the aircraft is to fly. The MD-80 is a bit problemtic on this front, because many of the noisy stuff you normally hear in the cockpit, like the engines, are hardly, if at all heard in the MD-80 cockpit. The engines are at the back, and as such you hardly hear them. Because of this the other sounds (gauges etc) have to be a lot better than they otherwise would have to be since they are so much more pronounced. The Super 80 pro is a bit of a mixed bag I’m afraid. The included engine sounds are maybe a bit too loud, but they are rather good and sound realistic to me. I especially like the battery sound, the way it sort of spools up on activation and down on deactivation. Also the sounds of the switches and buttons are very nice, for they really make you feel that you are actually setting them to alternate positions. What I like less are the F/O callouts. Whatever these are, it always sounds computerized. Phrases don’t sound very natural, and one- or two-word callouts sound fake in a way that it sometimes sounds as if a robot is sitting next to you and not a human being. This is something I always rather liked in the Leonardo Maddog, the PMDG MD-11 and the LDS767, just to name a few; the voices in these addons sound like human beings. Not “just” human beings either: people that have a job to do. During pushback in the PMDG MD-11, you get various commands, like setting the parking brake, and the fact that the pilot and ground personell say stuff like “We have parking brake set and erm… pressure is normal.” really livens up the whole experience of pushing back the plane. It’s a pity that the voices fall a bit short of expectation in this addon package, for many of the other sounds are quite good. Alas, if an update ever comes to this plane, I hope the voices are changed. I will not attempt to talk as if I know every switch and button on this plane, because I simply don’t. 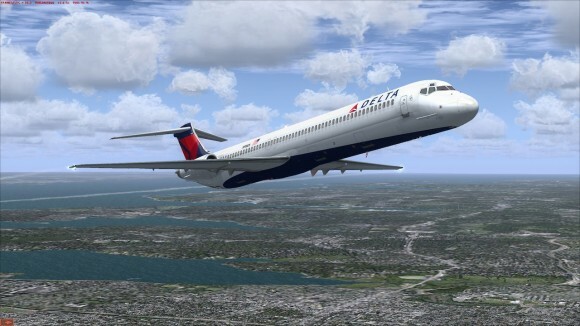 I’m not a MD-80 pilot and as such am not really able to say whether or not this plane flies realistically. I can only rely on statements made by third parties and my expectation of how the aircraft should probably fly. The only experience I have with flying the MD-80 is from flying the Leonardo Maddog, which of course is rival product. I can however comment on if the systems work as advertised. 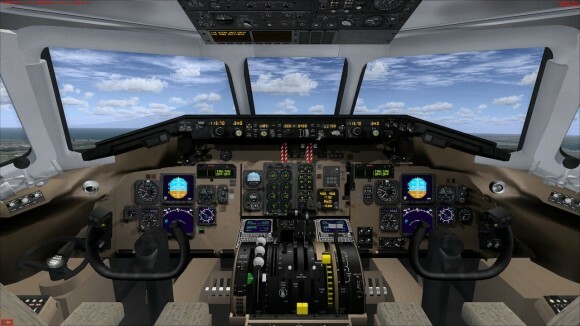 Before I started reviewing this plane, I had been flying the Leonardo Maddog, and I actually still do. As such, I do have some knowledge of how the systems on the plane should work, but there is a caveat: what if the Maddog has modeled things the wrong way? As a result, I will not be comparing the systems of the two addons from a technical viewpoint. I can however comment on amount of systems modeled and into what depth. It was immediately clear that the two addons do not model exactly the same things. For example, on the place where the Maddog has a flight recorder interface, the Coolsky has two IRS switches. There are more of such differences. I sort of like this, because it demonstrates the various cockpit layouts the plane could have and it adds some diversity to the models. So, flying the Coolsky is therefor not exactly the same thing as flying the Maddog. I have also noticed differences in procedures that are noted in the tutorials of the two addons. These are usually rather minor stuff, and you can use Maddog procedures on the Coolsky model and have a safe flight, so it’s not much of a big deal. As such, the way the systems actually work and how you operate them isn’t really different either, which is a good thing I think. 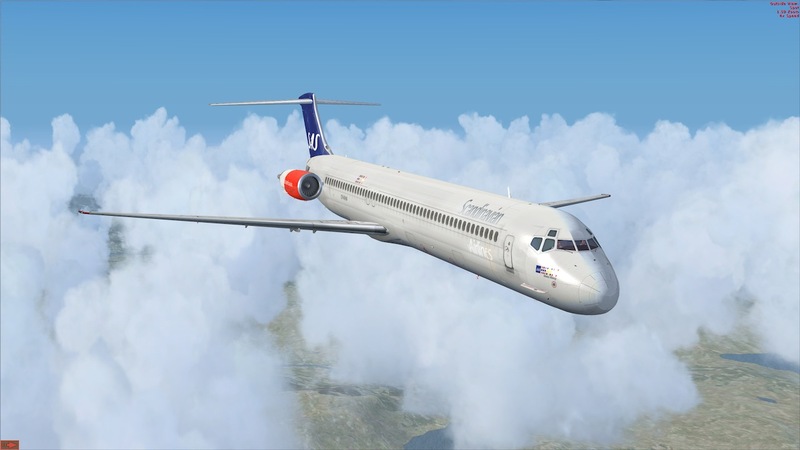 In this review I’ll tell about the short flight I did from Bergen to Trondheim, both in Norway. 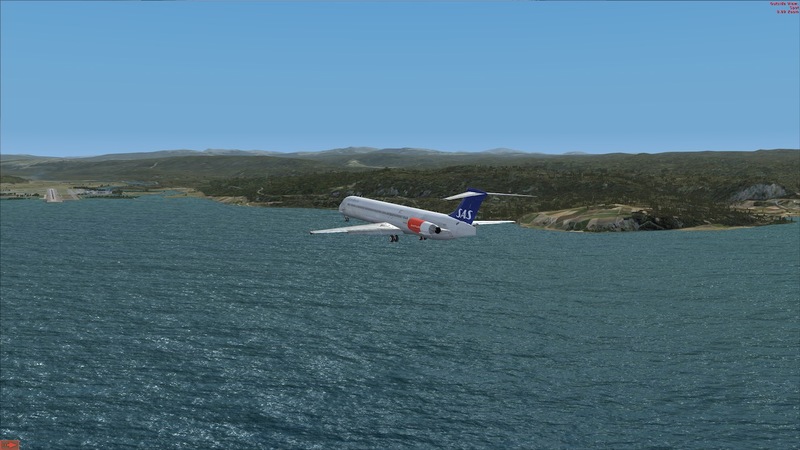 It’s a very beautiful flight, taking you over Norway’s rough and hilly terrain, filled with tiny lakes and streams. 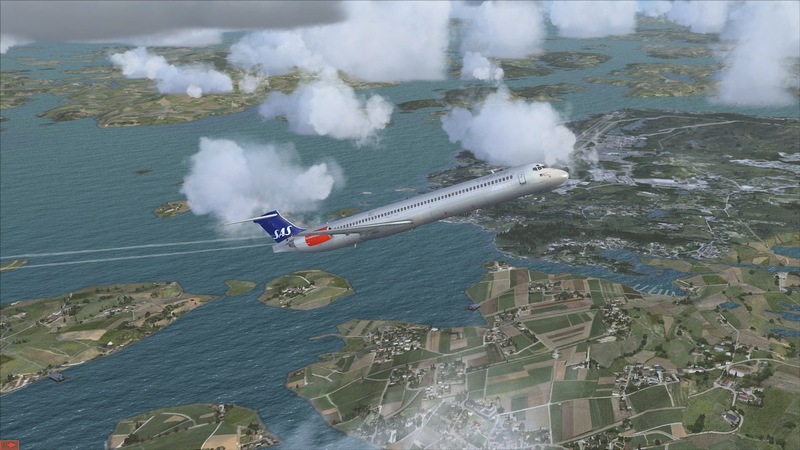 It’s amazing how Norway looks beautiful – even in the confines of FSX! 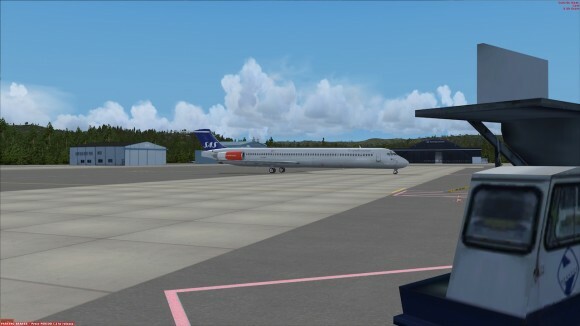 At Bergen ENBR gate 21. The flight starts on a lazy morning at Bergen’s gate 21. Via the IGS, I set the aircraft to a cold and dark situation. With everything off, it is silent in the cockpit. I turn on the battery, at which point a high pitched whine can be heard, low at first, but as the generators (I guess?) spool up the whine becomes higher and slightly louder. I love it when I hear these kind of sounds – gives me the sense of really being there. Next we have to start the APU. I hardly ever use the GPU and also in this instance I opt for the APU. Starting the APU is a bit more complicated than on most Boeing planes. First of all you have to turn on the start pump, which is a fuel pump that will supply the APU with fuel in situations where fuel doesn’t reach the APU by means of an already running pump. Turning on the APU in three easy steps. When we turn on the start pump, we can turn on the APU. We do this by holding the APU start switch momentarily on START, after which we let it go. At that point the APU RPM begins to rise (this can be seen on the APU RPM gauge), and with that also the APU EGT rises. When the APU has spooled up, the APU PWR available light will come up, signaling us to set the APU bus switches to ON. Now we have the APU powering the aircraft. Preflight can start. 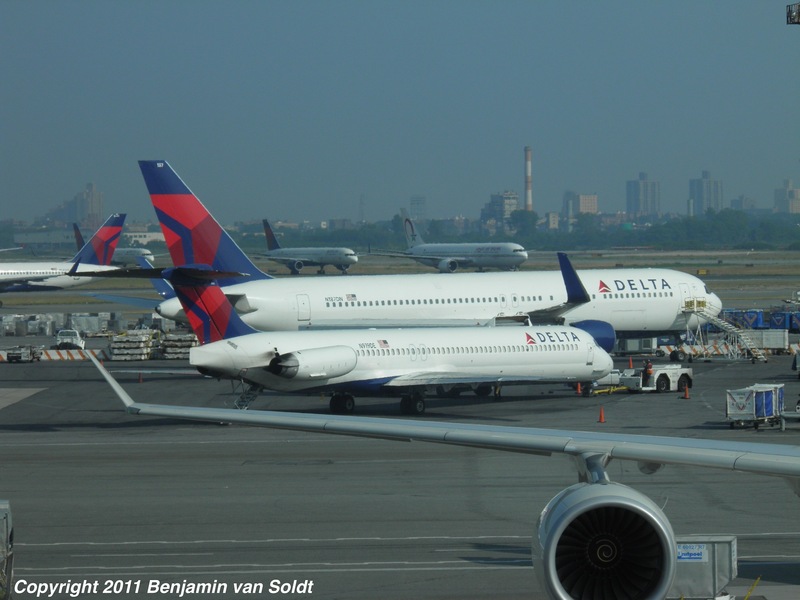 Once you have understood the flow in a plane, preflight will be done quicker and quicker. It is simply a matter of knowing what switches to flick, and when to flick them. As such, the MD-80 slowly looses its magic while operating becomes more and more routine. That’s not to say that I like the MD-80 less, or find it boring; not at all! It just becomes easier and easier to operate it. Preflight really isn’t that hard, you just need to know what to do. The FMC, for example, isn’t half as complicated as you might think and actually works pretty much like a Boeing 737 FMC. You fill in all the normal variables and you’re done. Form that point of view, the MD-11 is a much more complicated, much more interesting plane, for it truly is something completely different in that respect. 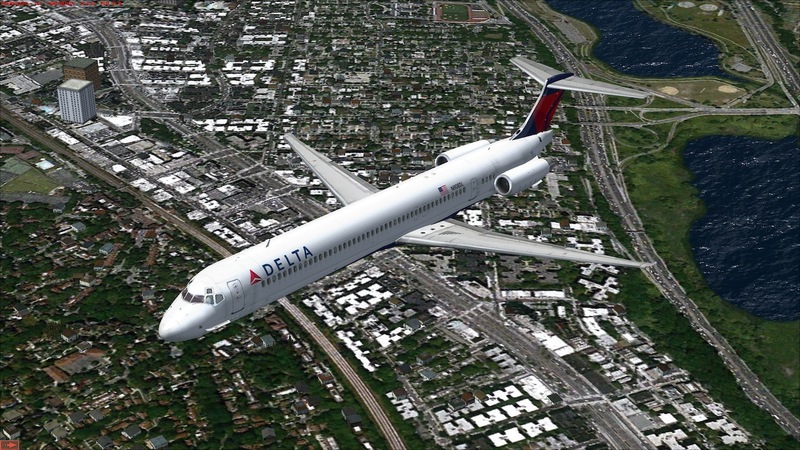 The MD-80 gets its charm from all the manual work you need to perform. Preflight itself is a standard procedure, but I will highlight some things that you might want to know. Navigraph support is given, so you can always have up-to-date navdata. You can also use company routes by entering the name of the file that contains the route. 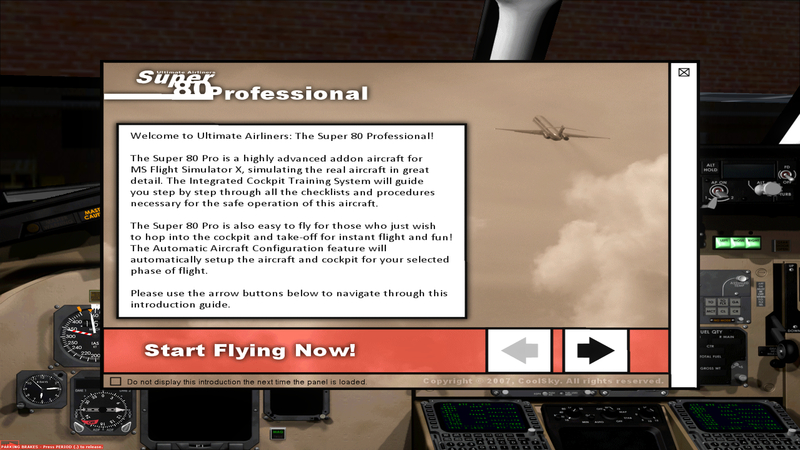 The nice thing is that the Super 80 pro uses FSX format flightplans for this, so you don’t need any fancy converting program or whatever to get routes to work in the Super 80 pro. One last thing that’s useful to know is the Dispatch tab of the Super 80 Center. It was discussed previously, but I thought it’d be nice to point out its use again in the context of this flight. Anyway, from here you can set the amount of fuel, cargo and passengers. The great thing here is the FMC button: click it, and all necessary info is automatically entered into the FMC. You can opt to enter all the data yourself, of course, but if you want to quickly get preflight done, then this is an ideal way to get all information in there, accurately and quickly. After finishing preflight and setting the FMC up, it is time to leave Bergen. 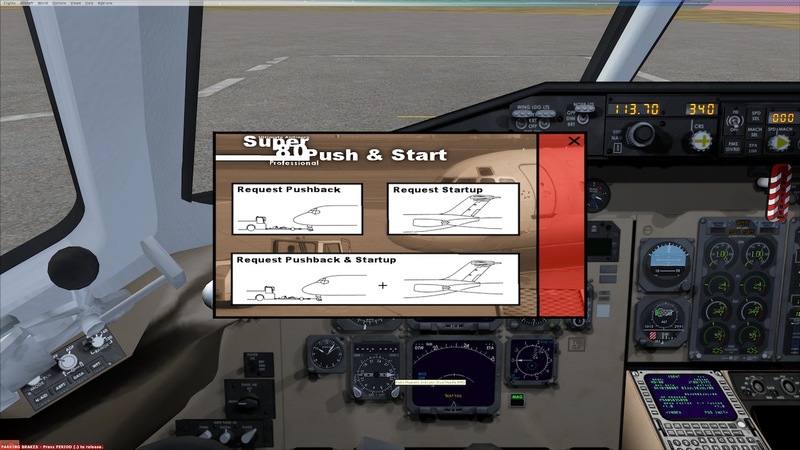 Using the push and start utility with which the Super 80 pro comes, it is easy enough to do this, although it seems it won’t turn your plane. It will push you back in a straight line only. It’s easy enough to turn your plane later, though, and start taxiing in the correct direction, so that’s no big deal. Contacting ATC, we are ready for taxi and are told to go to runway 17. Taxi is pretty unimaginative, although I was taken aback a bit by the amount of thrust you have to give to get the plane in motion. I remember from the Maddog that only a bit of thrust was enough to get the plane to taxi, but the Super 80 pro needs at least three times as much thrust. Is this a problem of the maddog or of the Super 80? 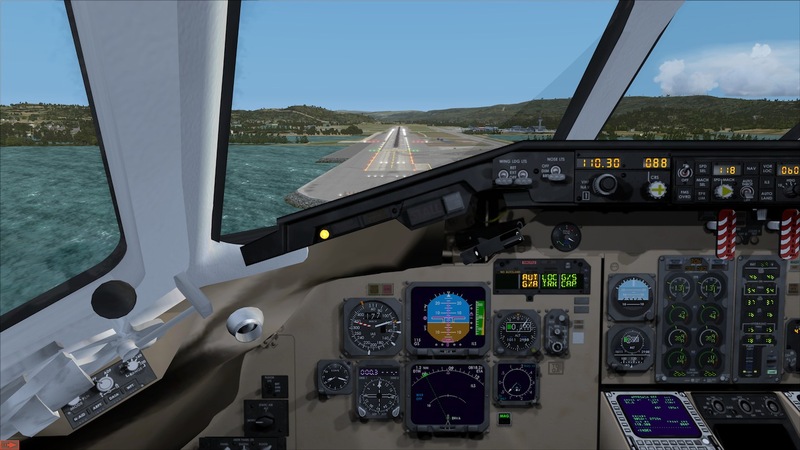 Enfin, we get safely to the runway and are immediately cleared for takeoff. Now it’s time to see what the autopilot can do. 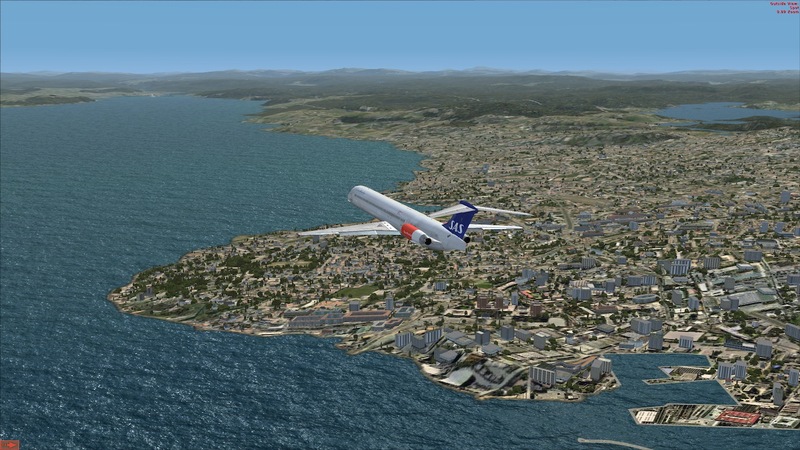 Following ATC’s instructions, I turned the plane and started to follow the flightplan. The autopilot does this with nice precision. Also climbing and descending is done with precision and generally it’s nice to see this plane flying automatically. As the flight progresses, the terrain is, as always, spectacular. All the lakes in fjords or simply beautiful to look at. UTX Europe and FSGenesis sure have done lots to improve this area! Meanwhile, the flight carries on as usual. I keep monitoring the instruments and everything is fine. The flight is pretty unimaginative without any strange stuff happening. As the plane turns (see below), the terrain under the plane can be seen. Signing of pleasure at seeing the rough terrain, I look out the window and admire Norway. Not before long, descent is commenced. At this point I take the autopilot of VNAV and use vertical speed and speed select modes to govern both descent rate and aircraft speed. I do this because of ATC: They rarely tell me to descend at the point where the plane actually wants me to descend, so using VNAV usually doesn’t work out that well. The descent goes on and on. Descent isn’t very quick… After finally getting down to 5000, I start getting approach instructions. Since I have landed at ENVA several times already, I know what to expect and I start slowing down the plane, deploying slats and flaps to 11. In the FMC I set the runway for landing, which is runway 5. 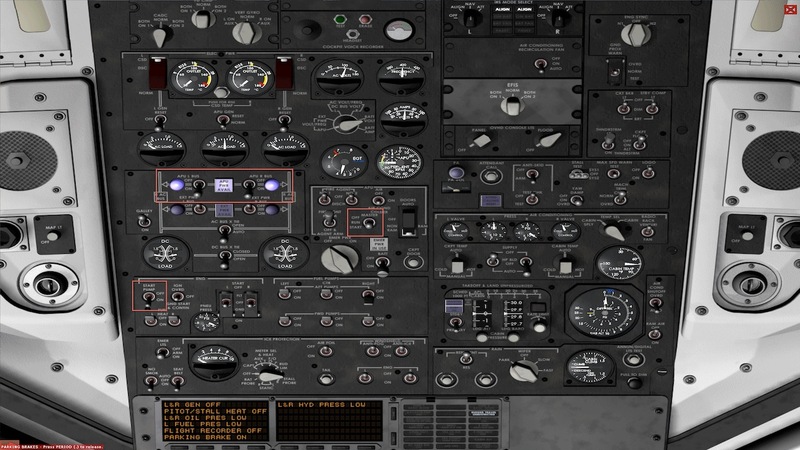 You dial in the course and ILS frequency into the radio positioned next to the autopilot controls. Unlike many addons, the Super 80 pro seems very focused on left seat operation of the plane, and much effort was done to uphold that philosophy. For example, the two nav radios you see on the glareshield show the same frequency on both captain and F/O sides. This is not because I entered the same frequency on both radios; this is because you only see nav radio 1 displayed. This does not mean that there is no nav radio 2. It is also simulated, but to get it to show, you press the little “1” you see displayed next to knob with which you can change the entered nav radio frequency. When you press the little “1”, it will change into a “2”, and you will be able to rune nav radio 2. 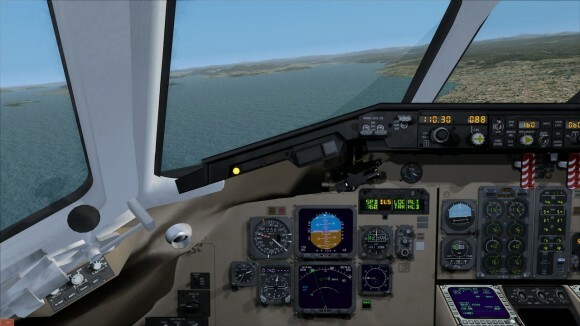 I personally don’t really like this approach because it detracts from the realism, in my opinion, although I acknowledge that it is easier in operation than having to turn your view and zoom in on a radio that’s at the other end of the cockpit. And indeed: as we get closer, I slow the plane down even more, drop flaps to 28 and extend the gear (don’t forget to set the auxiliary hydraulic pumps to high again!). According to the approach reference in the FMC, the ref speed for flaps 28 is 114kts. I don’t do that. Instead I fly a bit faster, at 124kts, since there is already a plane behind me hoping to land right after me. While I enjoy seeing the autopilot do a complete autoland, I find it more enjoyable to do it myself. So like with most flights, I disengage the autopilot somewhere between 400 and 200 feet above ground level and take the bird down myself. Touch down was not the softest I have ever done, but it’s okay. 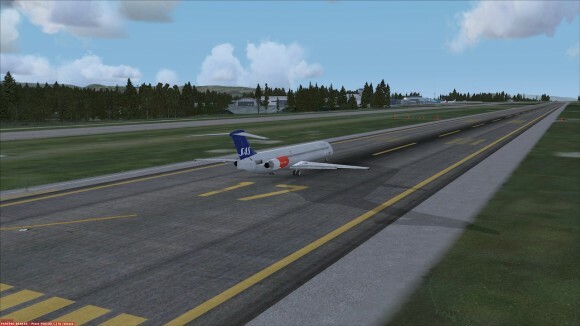 I quickly get off the runway so the MD-80 behind me can land. I retract the flaps and turn off the landing lights, and make my way to the gate under the watchful eye of ground control. 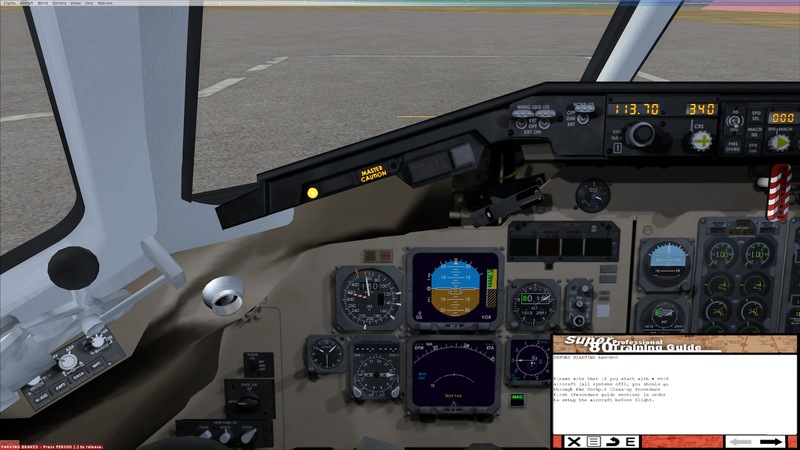 When arrived at the stand the APU is once again running (I turn it off for the flight, to save some fuel, then turn it back on after landing) and I can turn the engines. This is done simply by cutting the fuel supply to the engines at which point combustion will stop and the engines will slowly spool down. So there you have it. 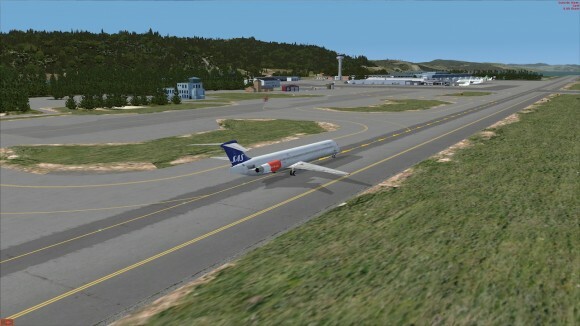 Flown from Bergen to Trondheim. The flight was short and sweet and rather enjoyable due to the nice weather and correct operation of the plane. Although I have some doubts about the thrust necessary to get the plane to taxi, overall it’s a nice experience. Of course, the simulated engines of the Super 80 pro might simply be less powerful than those of the Leonardo maddog, which would be a solid explanation for the little thrust needed to get the Leonardo maddog to taxi. I can be quick about this. The performance of this aircraft is very good. I was very pleasantly surprised to see how well this addon actually performs. 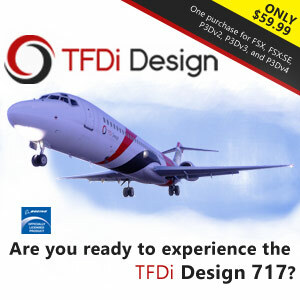 I bet it’s one of the best performing FSX jetliners money can buy you at this point in time, and I do not see this changing any time soon. At all times, the FPS were roughly 6 to 8 points higher than with just about any other addon I own. If your computer isn’t that fast, like mine, than this plane can be a true life saver in dense urban areas, such as New York City and Chicago. It is without a doubt that the Coolsky plane is one of the best aircraft addon for beginners. Its intuitive panel setup and amazingly helpful Super 80 Center with Integrated Cockpit Training System are for sure a treasure trove for those not familiar with jetliner (and MD-80!) procedures. As a result, I highly recommend this plane for beginners, or those that are simply not at all familiar with this type. The training system and checklists really make a huge difference. Do not underestimate the need of the manual, however! I recommend using both, and referring to the manual whenever you are not sure why something has to be done, or if you’re not sure about the inner workings of systems. 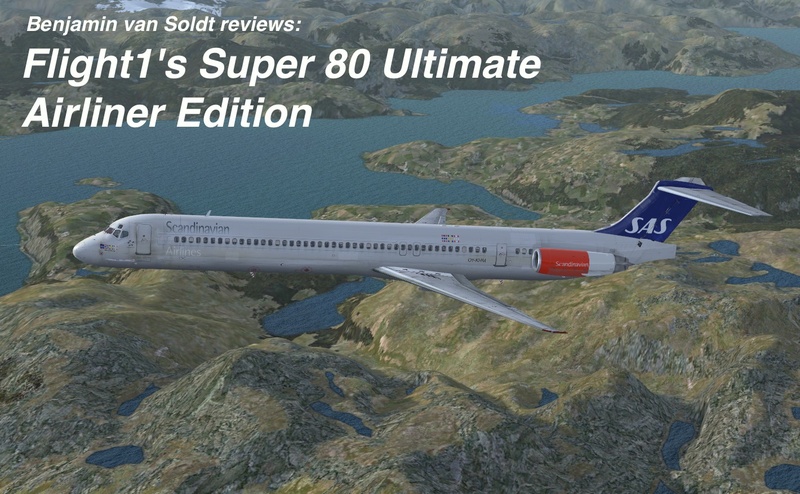 My final judgment is this: the Coolsky/Flight1 Super80 Ultimate Airliners Edition is a very good aircraft addon package. 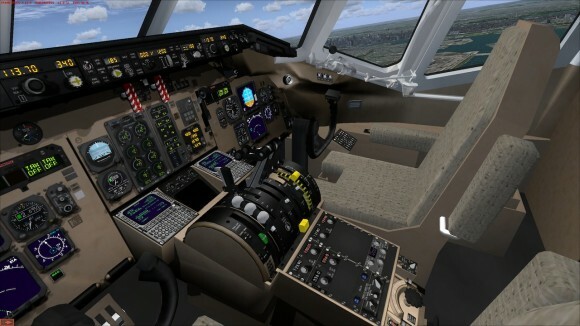 It’s a pinnacle of customer-oriented thinking, resulting in good support from Flight1 and the innovative Integrated Cockpit Training System, coupled to well-coded systems and a good visual model that is enhanced by multiple packs of McPhat liveries. All that, and a frame hit that is very small, which is something hardly any addon aircraft developer can say. Sadly, the VC is below standard and although most of the soundset is good, I dislike the F/O voice used, for it often sounds computerized to me. If the MD-80 is a type you have always wanted to fly, then the Super 80 Ultimate Airliners Edition might very well be a great package for you. Even if you don’t know how to fly it, the you will find that the user-friendly and customer-oriented way in which this product was put together, will get you in the air quickly. And if you have problems, the support forum is an open, friendly place where you can dump all your questions. Unless you demand a detailed VC, this addon package is for you. – Addons used: REX, GEPro, UT:Europe, FSGenesis mesh, World-of-AI packages + self-compiled AI packages. Medium: Boxed, no download available.